It isn’t too often that you walk into a restaurant and feel right at home. You know what I mean, right? That feeling of comfort, of welcoming faces and a place where you just feel down-right cozy. For me, that is Houlihan’s in North Dallas. 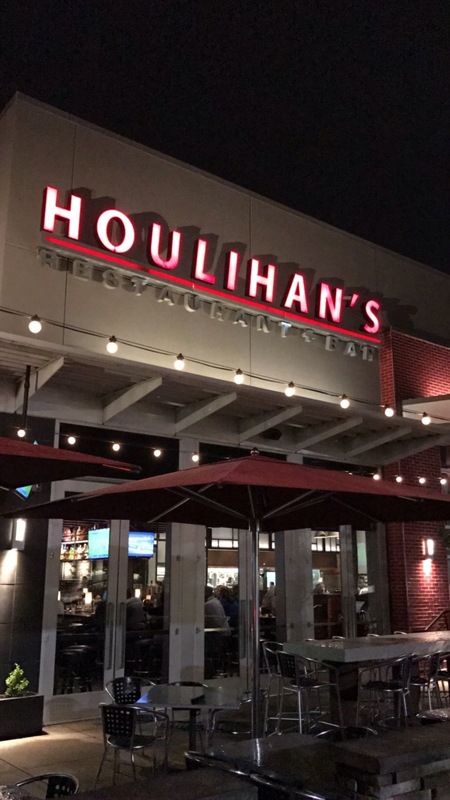 Houlihan’s has a long history of serving up deliciously consistent food and making it fun while doing so. On a recent visit, I was invited in to check out their Fall menu offerings and let me just tell you all…they are not to be missed! 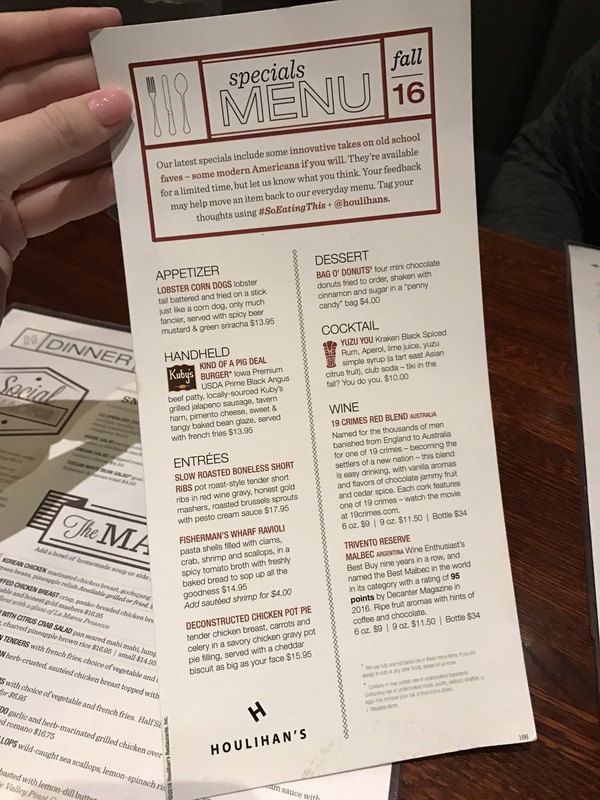 Just look at this menu! Lobster corndogs? Sign me up! One of our personal favorites on Houlihan’s Fall menu is the “King of a Pig Deal” burger. 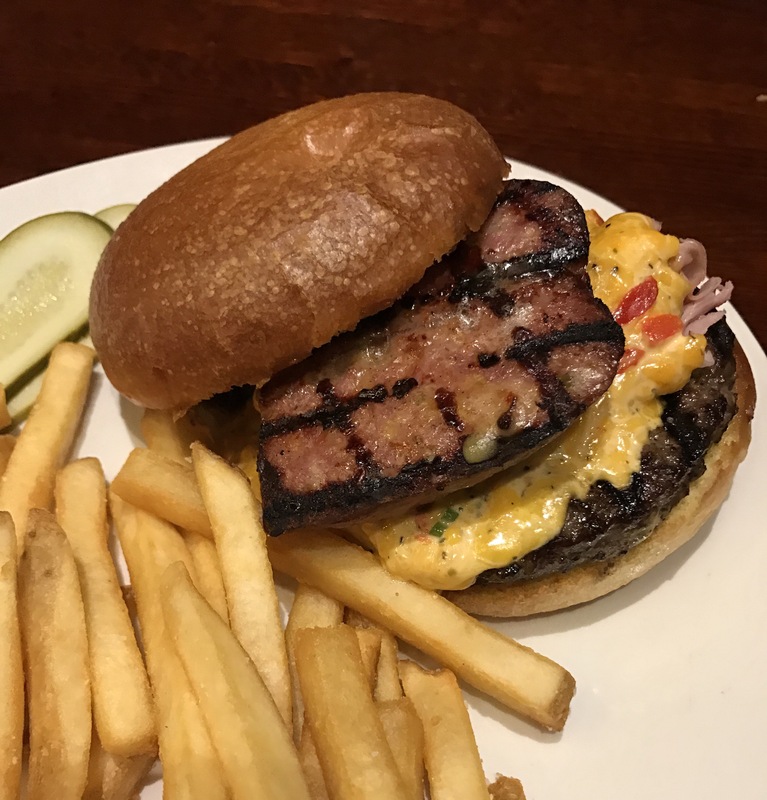 A juicy Iowa Premium USDA Prime Black Angus beef patty, locally-sourced Kuby’s grilled jalapeno sausage, tavern ham, pimento cheese with sweet and tangy baked bean glaze. Like, WHAT?! Yes, it was as delicious as it sounds – probably more delicious than it sounds if that is possible. I love the fact that Houlihan’s used local Dallas company, Kuby’s, to source their sausage, too! Another absolute favorite was the Bag O’ Donuts. 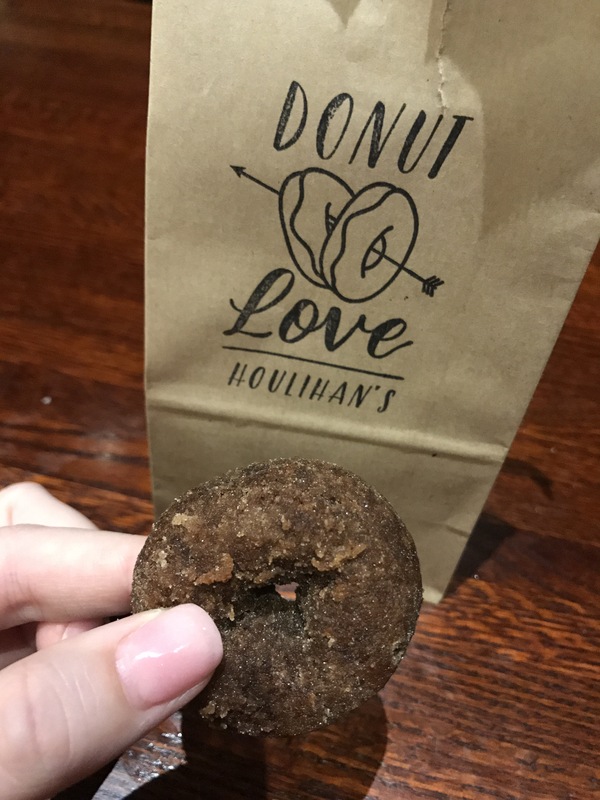 The most adorable brown bag package was delivered to our table full of piping hot cinnamon and sugar mini donuts. Quite frankly, I could have eaten about 12 bags of these on my own and called it a night, but I am so glad that I had the opportunity to try out the other delicious items, too! The Fall menu here at Houlihan’s does an incredible job of capturing those rich, hearty flavors that Fall is all about and, while it is only offered for a limited time only, there is plenty to go around in the meantime so you need to high-tail it in and try some for yourself.